Indigenous Science Speaker Series: Tsilhqot’in Nation v British Columbia – Aboriginal Title and Resource Management. 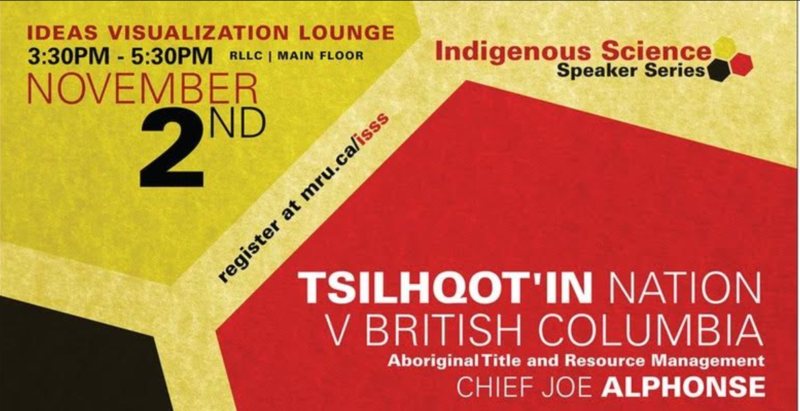 Chief Joe Alphonse will be coming to Mount Royal University to speak about the significance of Tsilhqot’in Nation title win at the Supreme Court. 3:30pm-5:30pm in the Ideas Visualization Lounge. Free Admission. Please register. 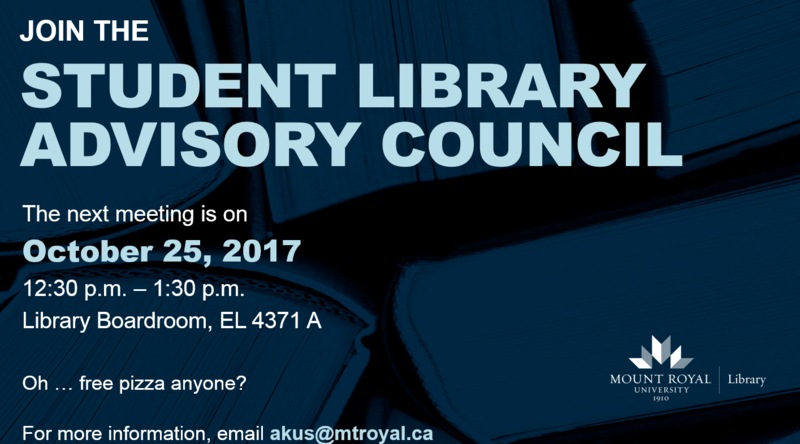 Please join us and add your voice to what you would like to see in the MRU Library! Who is the Maker Studio For? With the beginning of the school year, and all the happenings that go along with that, I started to reflect once again as to who and what is the Maker Studio for. It is refreshing to take a step back and see how it is coming together, and how it is started to be used after all this planning. I find it very moving to see the space for community and creation that we have developed at the university. The equipment in the space isn’t just a 3D printer or a sewing machine, they are tools to connect people. Tools for people to expand their possibilities and give them the option to exercise their agency in new ways. When a faculty member comes in saying he wants to design a skeleton to which he can attach functional muscles, he’s using the 3D printer for his community of practice. It is not only for his benefit, but it is for the benefit of a community of peers and students who are learning and working together. When someone from the community walks in and wants to practice sewing because she got a job as a seamstress, the Maker Studio is strengthening the university’s relationship with the surrounding community. But the space is also doing something I find pretty special. It is giving that person a space to be the best that she can be. She is trying her darnest to be the best seamstress that she can be at her new position. The Maker Studio is a safe environment where she can practice, learn from what went wrong, and bring her refined skills back to her workplace. And of course, there are the students. Over the past couple of weeks, I have had the privilege of working with Education students. Hear what their thoughts are on makerspaces and how they may be used in their schools and classrooms as they become teachers. How the space may be used for differentiated learning and asking ‘what is the best tool for the process we are learning?’ and not the other way around. It was also absolutely wonderful to see the students problem solve their understanding of the philosophy of the social studies curriculum through using the tools in the Maker Studio. They all rose to the challenge to try something new and embrace this process of creation with its successes and failures. They helped each other figure out their projects and it was truly awesome to see. Sometimes I have to stop myself from saying MY space when talking about the Maker Studio. But I guess it is my space, and it is OUR space. It is a space for people to come in and create, share, have fun. Be a community. The Mount Royal University community. What is the Maker Studio for? To learn new ways to be. Who is it for? Everyone.